23.734.030 Permit requirements and exceptions. 23.734.060 Percentage of required yard occupied and required setbacks. This chapter defines detached accessory structures on residential properties and establishes development standards for nonexempt structures. The purpose of this chapter is to promote a positive aesthetic relationship between accessory structures and primary structures on a property, in addition to allowing a positive community impact through the reduction of impacts to light, air quality, drainage, or aesthetics on surrounding properties. [Ord. 4-2017 § 3 (Exh. B); Ord. 12-2011 § 3 (Exh. A); Ord. 27-2008 § 1 (Exh. A § 4.12.010)]. The regulations and standards contained in this chapter shall apply only to those uses expressly identified in the corresponding section and shall be in addition to any other development standards and regulations contained elsewhere within this zoning code (e.g., lighting, landscaping, parking). These uses may only be located in those zoning districts as described in, and shall only be authorized in concert with the permit requirements of, Article 3 of this title (Zoning Districts, Allowable Uses, and General Development Standards). Additions and attached structures to primary structures shall comply with RCMC 23.704.030. Specifically, this chapter covers those accessory uses within the residential uses land use category. Additional provisions related to accessory dwelling units are provided in RCMC 23.901.060, which may be attached or detached to the residential structure. [Ord. 4-2017 § 3 (Exh. B); Ord. 12-2011 § 3 (Exh. A); Ord. 27-2008 § 1 (Exh. A § 4.12.020)]. A. Enclosed and/or solid-roofed accessory structures that are smaller than 120 square feet in size with no portion of the structure equal to or greater than eight feet in height. Structures shall not be located in a required front yard. Accessory structures shall be set back a minimum of three feet from side and rear property lines with a minimum six-foot separation between structures. B. Landscape features and play equipment that are smaller than 120 square feet in size with no portion of the structure equal to or greater than eight feet in height. Landscape features that exceed 120 square feet in size and greater than eight feet in height shall meet the accessory structure standards and setbacks. Landscape features shall be set back a minimum of three feet from all interior property lines with a minimum six-foot separation between structures. 1. Landscape features shall be constructed with finished building materials e.g., wood, steel, wrought iron, brick, natural stone, or other forms of material acceptable to the approving authority. [Ord. 3-2019 § 5 (Exh. A); Ord. 4-2017 § 3 (Exh. B); Ord. 13-2013 § 4 (Exh. B); Ord. 12-2011 § 3 (Exh. A); Ord. 27-2008 § 1 (Exh. A § 4.12.030)]. Shipping containers, railroad containers, vehicles, and other similar container devices are not considered a residential accessory structure and are specifically titled as a nuisance in the city’s Nuisance Code (RCMC 16.18.401(A), nuisance generally). A temporary use permit is allowed for pod containers as provided in RCMC 23.922.030(A)(4). [Ord. 4-2017 § 3 (Exh. B)]. A. Development standards in this section are intended to supplement the standards in the underlying base zoning district for accessory structures. In the event of conflict between these standards and the underlying base zoning district regulations, the provisions of this section shall apply. In the event of conflict between these standards and the overlay zoning district regulations of Article 3 of this title, the overlay zoning district regulations shall apply. B. Accessory structures greater than 120 square feet in size shall not be allowed in residential zoned R-10, RD-15, RD-20, RD-25, RD-30, MDR, HDR, and RMH. C. Accessory structures must be constructed in conjunction with or subsequent to construction of the primary building(s) on the site. D. The appropriate approval authority may apply additional conditions to a use permit relative, but not limited, to dwelling size, location, access, and height, if special circumstances arise requiring such mitigation of anticipated adverse impacts to neighboring residences. [Ord. 4-2017 § 3 (Exh. B); Ord. 13-2013 § 4 (Exh. B); Ord. 12-2011 § 3 (Exh. A); Ord. 27-2008 § 1 (Exh. A § 4.12.050). Formerly 23.734.050]. A. Accessory structures less than 120 square feet shall be constructed of appropriate materials and colors of the residential neighborhood. Premanufactured kits that require assembly are exempt from this requirement. B. Accessory structures 120 square feet and over shall be architecturally compatible and constructed of appropriate materials and colors of the residential neighborhood. Walls that are longer than 15 feet in length shall include doors, window, or architecture features that break up the wall. [Ord. 4-2017 § 3 (Exh. B)]. A. Proposed structures must meet the development standards outlined in Table 23.734-1 (Development Standards for Accessory Structures); also see Figure 23.734-1 (Development Standards for Accessory Structures). Unless otherwise described in the table, all accessory structures must meet the setbacks in the General Accessory Structure category. B. 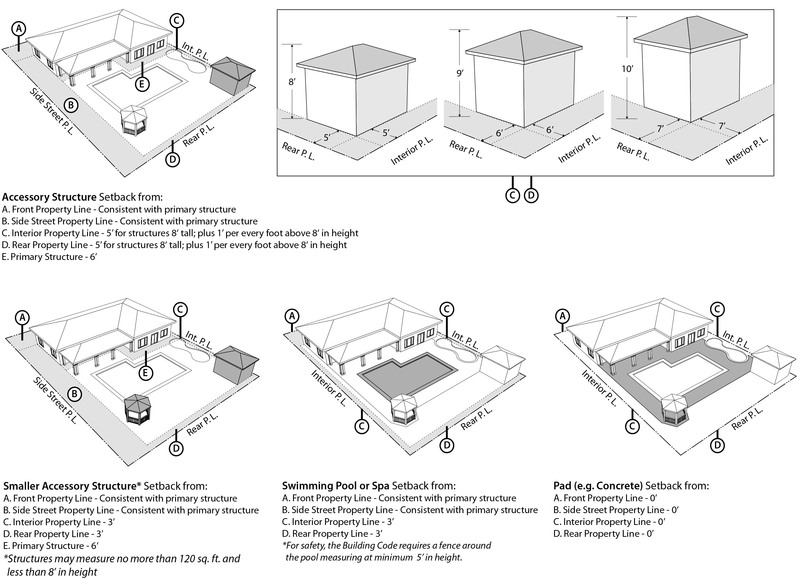 Lots less than one-half acre in size: the total square footage of all accessory structures on a single parcel, except swimming pools, shall not exceed 30 percent of the habitable floor area of the primary residential dwelling on the same parcel. Landscape features are exempt from the total square footage of accessory structures. C. Lots one-half acre and greater in size: The total square footage of all accessory structures on a single parcel, except swimming pools, shall not exceed 50 percent of the habitable floor area of the primary residential dwelling on the same parcel. Landscape features are exempt from the total square footage of accessory structures. D. Not more than 30 percent of the required rear yard shall be occupied by all permitted structures. Landscape features are exempt from the 30 percent calculation. E. Accessory structures and swimming pools, spas, and pool equipment shall not be located within recorded public utility easement or public easement. F. On all lots, the accessory structures shall not be placed in front of the principal building. G. Swimming pools, spas, and pool equipment may not be located within the required front yard. H. The minimum setback distance shall be consistent with the primary structure underlying zoning district. I. Swimming pools, spas, and pool equipment may not be located within the required street side yard. J. Maximum structure height is 16 feet as indicated in Table 23.310-2 (Residential Zoning Districts Development Standards). K. Detached accessory structures shall not be located closer than six feet from any structure. L. Any accessory structure located less than six feet from a primary building shall be considered attached to (and part of) the primary building (RCMC 23.704.030(D)). M. Swimming pools and spas shall not be located closer than three feet from the principal building and detached structure. The building official may approve setbacks of less than three feet with submitted structured engineered plans. The structure shall not be placed closer to the front lot line than the farthest back front wall of the principal building. For structures 8 feet in height, the minimum setback is 5 feet. The structure’s setback shall be plus 1 foot per every foot above 8 feet in height. [Ord. 4-2017 § 3 (Exh. B)].